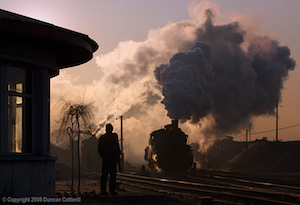 The days when steam locomotives were easy to find are long gone and the best locations are often far from each other. 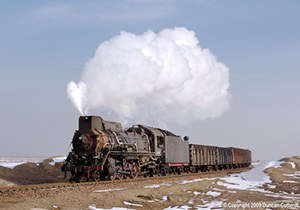 On this trip we set out to visit two of the furthest apart, the opencast coal mine at Sandaoling in the north-western province of Xinjiang and the narrow gauge coal railway at Huanan in eastern Heilongjiang. These are two very different operations yet they share some common features beyond the fact that they both haul coal, most notably the use of banking engines. An autumn trip to the Rhätischebahn in the mountainous south-east Swiss canton of Graubünden. The line is a photographer's dream with superb scenery, attractive liveries and frequent trains, many of them loco hauled. 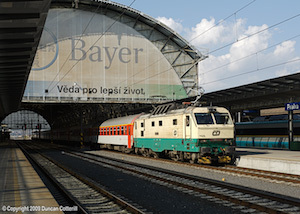 With new EMUs likely to enter service during the first half of 2010, this was a last chance to photograph the old order in the autumn. 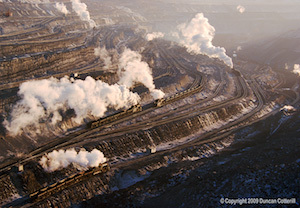 The opencast coal mine at Zhalainuoer is probably the greatest steam spectacle left in the world today but it won’t be for much longer. Railway operations within the big pit are expected to cease later this year and diesels are currently being acquired for the surface lines as well. The opportunity to visit Zhalainuoer in March 2009 for one last time was just too good to miss. We also visited Baiyin, a much smaller operation but with a reasonably long main line featuring semi-desert scenery and steep gradients. 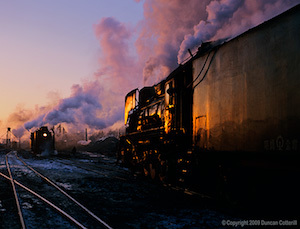 Pictures of China Railway steam around Bei'an in 1999 have been added to the Bei'an gallery. 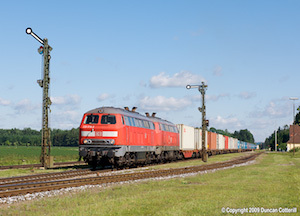 Subject matter includes high-deflector QJ and JS hauled trains, glints and silhouettes at the depot and even a couple of vintage diesels. More Chinese photos, this time mainly from from my diesel trip in October 2008. 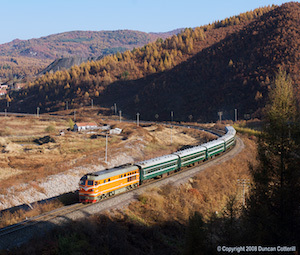 The pictures are from the Tonghua, Bei'an and Mudanjiang areas, the Beijing - Longhua line and the Fushun Mining Railway. Pictures from my November 2008 trip to the Huanan Forestry Railway and Jixi Mining Railways have been added to the appropriate photo galleries. 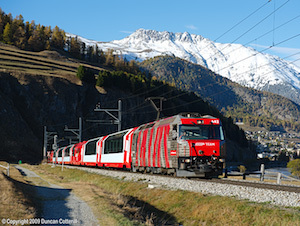 Almost forgot that I visited the Matterhorn Gotthard Bahn as well as the RhB on my recent visit to Switzerland. A few MGB pictures from that trip have been added to the photo galleries. 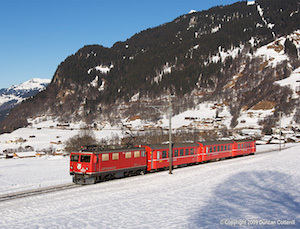 A selection of pictures from my recent trip to the Rhätischebahn have been added to the Photo galleries. 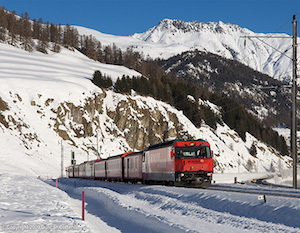 The Rhätischebahn operates a large network of metre gauge lines in the south-eastern Swiss canton of Graubünden. After a short visit in December 2007, I resolved to go back for a longer period in winter 2008/2009. This is the report of that trip, from 07 to 19 January 2009. 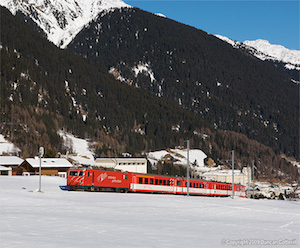 The railway serves the industrialised area around the regional capital, Chur, as well as the Alpine resorts of Klosters, St. Moritz and Davos and even reaches Italy via the Bernina Pass, the highest adhesion-only crossing of the Alps. 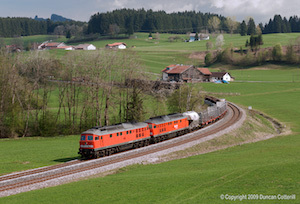 There are regular passenger services, most of them locomotive hauled, and a surprising volume of freight traffic all running through superb alpine scenery.